Thank you very much for reading this page. First of all, I must tell you that I truly love skiing. The sport of skiing has been very special to me. Since I feel like it is my mission to ski. Skiing has given me not only the daily happiness, but also it changed my life, and it changed my way to see the world. I would like to spread the pleasure and the happiness of skiing. I really feel that it is my lifetime mission. Please join my ski lessons with no worries. My Ski-Lessons are consisted by 2 categories. Most of the camps are consisted by 2 days in weekends and national holidays. Those have special targets what to do and what to learn. Video everyday, and have video reviews. Listen, which suits your desire, we will provide the best way to achieve it. Any number of people will be accepted. Preferably less than 7 skiers at one time. ◇Please click here to see the pricing. These pricing does not include rental skies, or lift tickets. I write about myself a little more. I was born in Japan, Gunma prefecture in 1955. I studied English literature in Aoyama Gakuin University. In early age, I was a swimmer and competed in swimming races, and became the Prefectural swimming champion in 200m Individual Medley. I started Freestyle skiing when I was attending university. From the late 1970s to mid 1980s, I won most of the titles of Freestyle competitions in Japan, and some international competitions. I earned the Japanese National Combined Championships 7 times and 35 individual national titles. Also I achieved many times top ten standings in World Cups and World Championships. I retired from Freestyle competition in 1986 and became Japanese National Team coach. 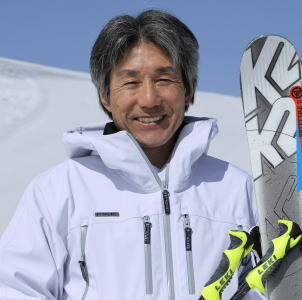 Then I started my own ski school in 1994 in Hakuba area in Nagano prefecture. Freestyle skiing has not been the only my speciality, I also competed in Alpine races and basic skiing competitions. In the year 2000, I decided to come out of retirement and re-enter the world of competition. A year later I attained second place at the 2001 National Freestyle Ski Championship. During this period I also re-started many Big Air shows, Acro ski shows, and Mogul demonstrations. In 2005, when I turned 50, I began competing in Masters' swimming races. I won my first title of National Championship of 50m Freestyle in 2007. I then won the many titles of 50m Butterfly. I am dedicated to performing my best at skiing and swimming for the rest of his life. Although sport has dominated most of my life, I also have a love for writing and a love for classical music, and began to publish articles and books in the late 1990s. Ushio Literary Prize was given to me in 1998 for a nonfiction story,“The falling stars of the Nagano Olympics”. In addition to stories and novels, I also have written many ski books, swimming books, and classical music essays. Please clic the link below to see further self-introduction. Please refer to the following pages. copyright©2000 The World of Masahito Tsunokai all rights reserved.